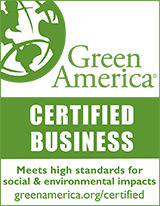 Certified to remove allergens, dust, dust mites, pollen, mold, animal dander and more. Free Shipping on all Air Purifiers and NO sales tax. 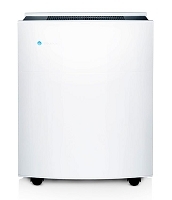 Blueair 211+ Air Purifier - Blue Pure by Blueair - Quiet, ultra-compact for rooms up to 540 sq. 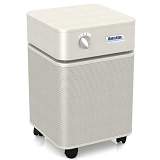 ft.
Austin Air Healthmate Standard Air Purifier - Made in USA, all steel housing, 5 year filter, up to 1500 sq. ft.
Blueair Sense+ Air Purifier with WiFi, Remote App, Filter Change LED, super quiet, great for a bedroom. Six colors available. 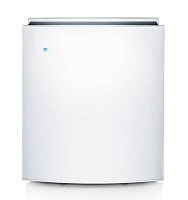 Blueair Classic 405 Air Purifier with WiFi, LED filter change indicator- Quiet, efficient, stylish HEPA air purifier with 434 sq. ft. coverage. IQAir GC Multigas Air Purifier - Specially designed for Multiple Chemical Sensitivity and smoke and odor control. 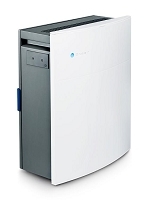 Blueair New Classic 605 Air Purifier with WiFi, phone app, LED for filter change - Quiet running, easy filter changes, 775 sq. ft. coverage. 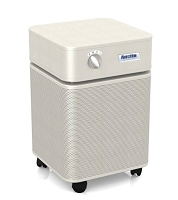 Austin Air Healthmate PLUS Air Purifier - Additional capabilities for gas, odor, Multiple Chemical Sensitivity up to 1500 sq. ft.
Austin Air Allergy Machine Standard Air Purifier - great for allergies and asthma, ultra fine particles, up to 1500 sq. ft.
Austin Air Bedroom Machine Air Purifier - Developed specifically to improve sleep i up to 1500 sq. 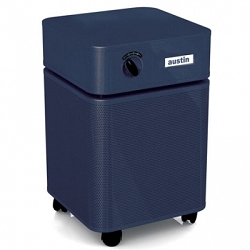 ft.
Austin Air Pet Machine Air Purifier - Reduces pet odors, pollen, allergens and pet dander in up to 1500 sq. ft.
We are an Authorized Dealer for IQAir, AustinAir, Brondell, Coway and Blueair HEPA Air Purifiers and Replacement Filters. 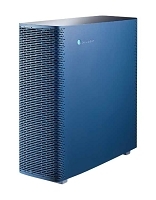 All Air Purifiers are sold with Free Shipping and No Sales Tax. Free Shipping limited to Continental US. We offer only the top-rated HEPA air filtration products, filtering 99.97% of particles 0.3microns, (1/200th the width of a human hair)! You will improve your health with an air purifier. The average person spends about 90% of their lives inside. The Environmental Protection Agency estimates that indoor air is two to five times more polluted than outdoor air. 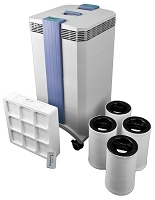 One of the solutions to indoor air pollution is purchasing a quality air purifier. BestFilters.com offers many of the highest rated of HEPA air purifiers including Austin Air, Blueair, IQAir, Coway and Brondell. To be a certified HEPA filter, the air purifier must remove from the air at least 99.97% of all particles as that have a size of 0.3 microns or larger (1/200th the diameter of a human hair). Allergens such as pollen, animal dander, mold spores, and dust are captured by the filter. Many HEPA air purifiers also incorporate a carbon filter to capture chemicals, gases, and even odors. How Indoor Air Pollution is created? Today's tightly-sealed indoor spaces trap all kinds of contaminants: chemicals and irritants released by cleaners, carpeting, paint and perfumes, and pollutants like tobacco smoke, pollen, mold, dust, and animal dander can cause asthmatic and allergic reactions. The solution is to remove these pollutants from your interior spaces. Part of that solution is a high performing HEPA air purifier. High-Efficiency Particulate Air or HEPA. To qualify as HEPA by US government standards, an air filter must remove 99.97% of all particles greater than 0.3 microns in size from the air that passes through the unit. According to the EPA, health effects may be delayed in creating symptoms and show up only after long or repeated exposure to airborne allergens and pollutants that can cause allergies (and more serious health problems) to develop later in life. Why we don't sell ozone generating air cleaners? Ozone generators produce the gas ozone, which is an extremely potent oxidizer. Ozone is of three oxygen atoms and is the same molecule that makes up the "ozone layer" of our upper atmosphere. Stratospheric ozone is a good thing because it protects us from dangerous UV rays; however, ozone in the air we breathe can be harmful to your health. The U.S. Environmental Protection Agency (EPA) states that "relatively low amounts can cause chest pain, coughing, shortness of breath, and throat irritation. Ozone may also worsen chronic respiratory diseases such as asthma and compromise the ability of the body to fight respiratory infections and scientific evidence shows that, at concentrations that do not exceed public health standards, ozone is considered ineffective in controlling indoor air pollution." The American Lung Association states that "ozone is a potent lung irritant and exposure to elevated levels is a contributor to the exacerbation of lung disease; it is especially dangerous for persons with asthma and other chronic lung diseases, children, and the elderly." Many of our competitors sell ozone generators and ionic air cleaners that also generate some ozone, but we think any level of ozone is dangerous and we will not offer any air purifier that generates ozone. What about Ionic Air Cleaners? Our research, along with the prevailing opinion of most testing facilities, has found that ionic air cleaners are ineffective beyond a three foot radius of the unit. 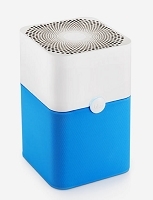 Most testers place a "do not recommend" on all the ionic air cleaners they've tested. Thank you for selecting Bestfilters.com. We are consistently the highest rated online retailer of water filters and air purifiers.Certainly there are cheap, inferior air purifier products that don't perform as well and will need to be replaced in a few years when they wear out, that are available at the Big Box stores. We don't carry any of those. 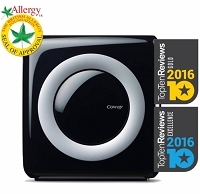 HEPA air purifiers are excellent for allergies, pet dander, mold spores, pollen, VOC's, tobacco smoke, odors and other allergens. Our selections have all been tested and evaluated by our staff. Our staff is available to help you with a selection that will fit your specific needs. Our products are always on-sale, at the lowest prices allowed by our manufacturers. With Free Shipping in the continental USA and Sales Tax Paid you save even more money. Call 800.842.4605 or chat with us online for knowledgeable advice and today's Unadvertised Specials.